from big-dollar corporate backing. 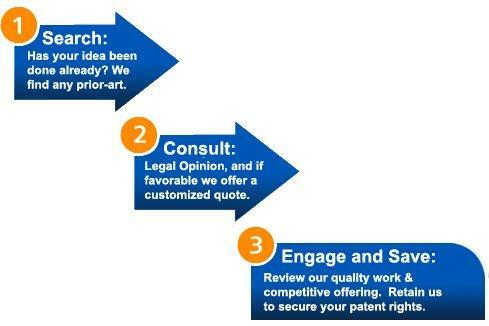 For this reason, Patent Services provides consultation and education programs for select projects and clients. All costs are established through a sophisticated clearinghouse system developed in-house. Such clearinghouse estimates consistently outperform average costs collected in intellectual property industry journals. By creating level competition between contractors like registered patent attorneys and presenting a high volume of clients seeking professional IP services, costs have been driven down considerably. Before the patent clearinghouse model was perfected, invention promotion and patent marketing companies were some of the only low-cost development options available. Patent Services reflects a collaboration between experts in the intellectual property, product development and invention fields. Initially a think tank comprised of registered patent attorneys and business professionals, the organization formalized in response to a statistical patent boom and changes in global patent laws. Early on, Patent Services established the patent clearinghouse model as a key trade secret in their field, with large-scale buying fueling a cost advantage over working with unaffiliated patent attorneys. Since the early days, the model has been expanded to include product development, startup enterprise support and licensing contractors. Most notably, agents and licensing resources can often be secured through volume contingency agreements where inventors don't pay any patent marketing fees out of pocket. Patent Services was optimized for the funding and support challenges that independents and start-ups encounter, but working through a clearinghouse has proven attractive to larger companies making their first patent filings. With its founding, Patent Services marks the first such patent clearinghouse available to independent inventors on a large scale. In 2013, parts of the America Invents Act were put into effect, creating a first to file standard for patents in the United States. This changed the legal landscape for all patent candidates, big and small. One side effect was a considerable increase in demand for patent work - the industry has experienced a sharp increase in patent filings and inquiries. As practitioners focused on large-budget business operations, a huge void opened for independents and small businesses looking to hire attorneys. The clearinghouse model developed at Patent Services actually organizes independents into volume agreements, with Patent Services working as a corporate representative in each negotiation. The result is a loud voice for inventors to demand reasonable costs and top quality from industry contractors, just like the big companies can. We pride ourselves in being very approachable to independent inventors or individuals who may have a first big idea in mind. Even a passing thought should be treated as a trade secret with valuable market potential. Looking into such potential starts with a statement of non-disclosure and a confidential submission and review process. Because not every idea proves to be a valuable trade secret or patent opportunity after further review, we offer this screening at no cost. If everything checks out, your idea may be eligible for some of the special treatment and pricing that's making a buzz in our field. Start with a confidential submission. Our statement of non-disclosure and confidential submission form (step 1) is available here. Learning resources are available in our Learning Center here. Our offices are open from 9am-9pm Eastern Standard Time. Please call us with any questions or concerns. PLEASE NOTE: Do NOT send any sensitive information without establishing a statement of non-disclosure first.